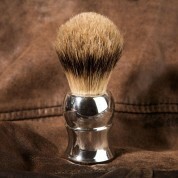 Any gentleman's grooming kit should have an elegant pewter shaving brush inside. This brush has premium silver tip badger hair bristles that emerge from an elegantly styled pewter handle, which is weighted to allow the brush to stand upright when not in use. 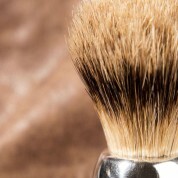 This gift is the perfect addition to a bathroom and guests will comment on the luxury brush when they spot it. It is the perfect gift for a well groomed gentleman for valentine's day, a birthday, Christmas or fathers day – for a boyfriend, a dad or grandad perhaps. It is well packaged in a chic cream and black gift box. 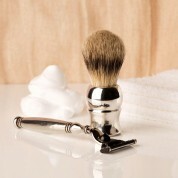 Why not add a pewter shaving razor to go with this gift? Available in our gifts for him category.